Stace and Rosie met twelve and a half years ago in secondary school when they both studied music for GCSE. Rosie had switched class to be with her friends – lucky she did, or the couple may never have met. It was fate! Since then they’ve been to University, lived in other countries and travelled the world together, and as Stace says, ‘it just works’. 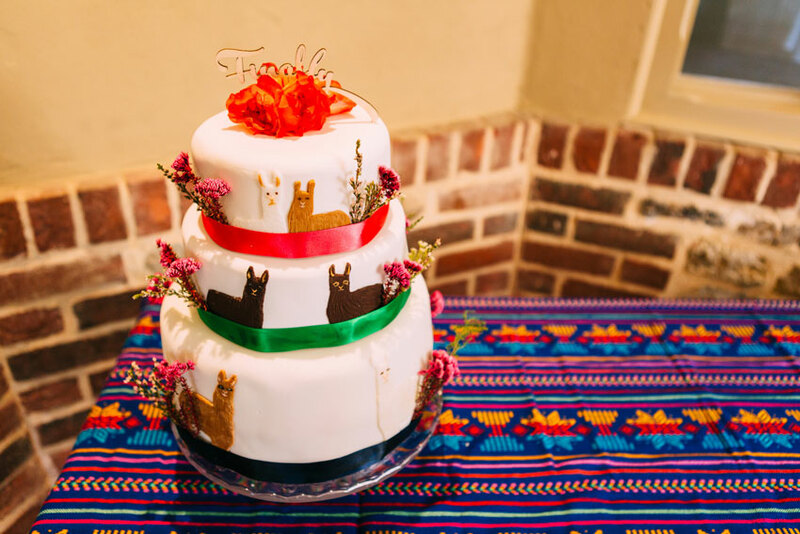 We asked Stace about their wedding day and what they decided to patchwork. How did you and Rosie get engaged? We went travelling a few years ago and by this point had been together around ten years, so I decided that it was finally the right time to propose. I had a bit of a hard time deciding where to do it (Peru, Brazil, Mexico etc.) but eventually settled on Machu Picchu. I waited until most of the crowds had gone at the end of the day and proposed on the edge of an Incan Terrace overlooking the main part of the site. I carried the ring around in my belt for 3 months! When it came to the wedding day, what did you plan? 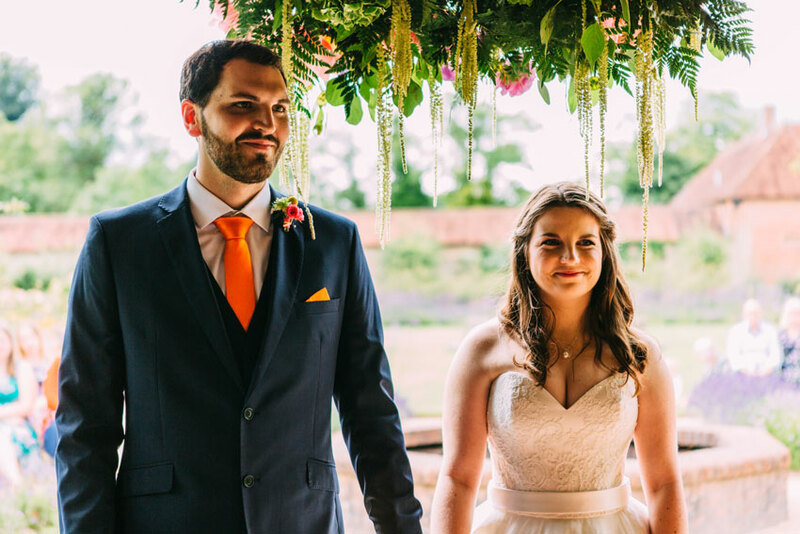 We wanted a wedding with a traditional structure but a relaxed, familiar and fun feel. 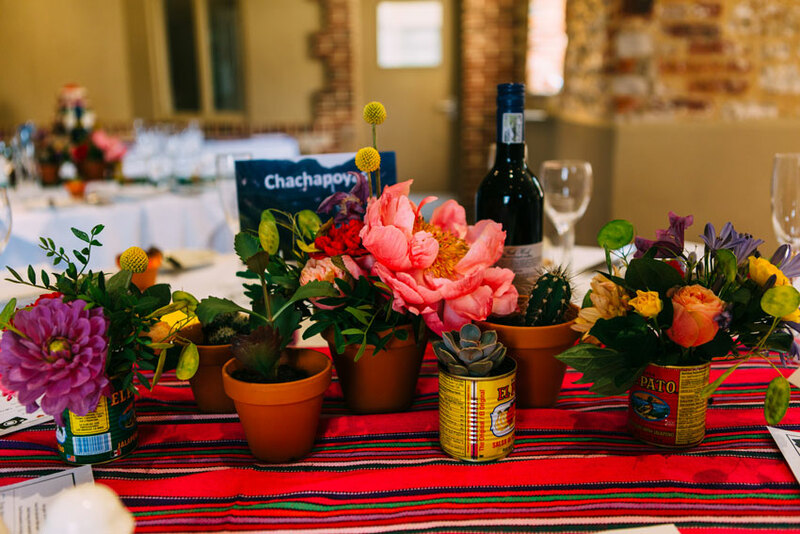 The “theme” of the wedding was Latin America inspired by our engagement and travels. We used very vibrant colours for the flowers, decoration and ties. 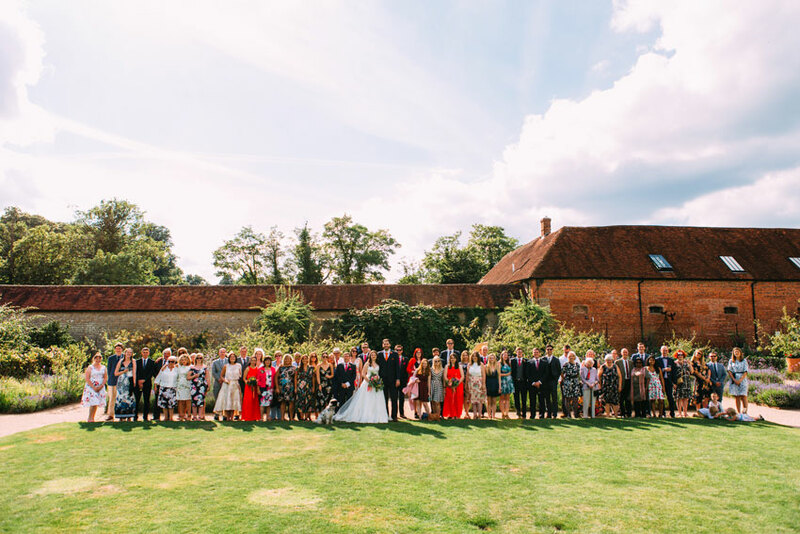 Our venue was actually a walled garden, as we both wanted an outdoor ceremony, and the garden was really great for our guests to enjoy into the evening on a warm summer’s day. 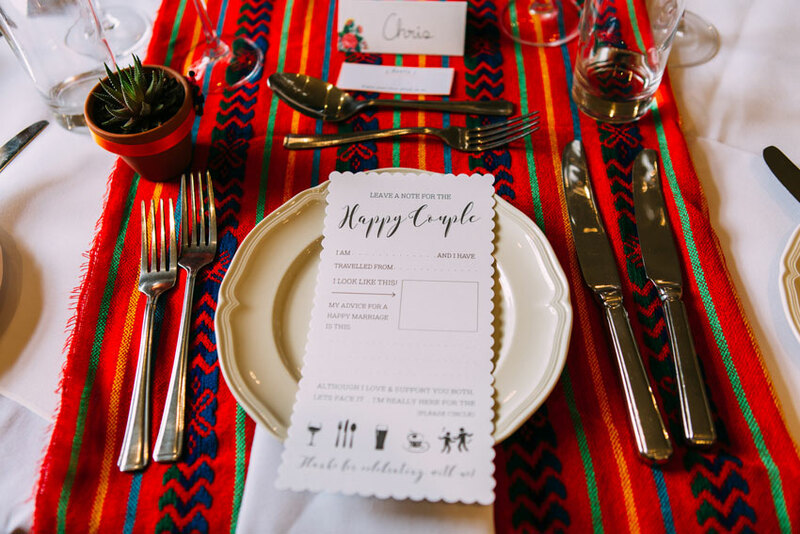 The food was on sharing platters, because we wanted to try and avoid awkward moments on those tables where people had never met one another before. What piece of advice would you give to other couples? Be a team, take your time, don’t sweat the small stuff. Something will always go wrong but it will still be the best day of your life. Don’t worry too much about everyone else’s opinions – do what feels right for you. Our first dance was “Sunday Morning” by Maroon 5. We chose it because it’s a song that we’ve both been listening to together for a long time. We actually got a lesson in to funk the dancing up a little, but unfortunately when it came down to it, Rosie’s dress was too big to do it! We wanted to make sure that our cockapoo, Leo, could be a part of our big day. It was great when Carla from Dogvision brought him in to mingle with everyone and have photos taken – he was very well-behaved. It’s as though he knew! Exchanging our vows – we kept our vows a secret from one another and it was worth the wait to hear each other’s promises. Walking out of the garden after the ceremony and coming back through the wrong door – it gave us a long walk all the way round the venue and some time to ourselves between the ceremony and the drinks reception. We came back in through the back doorway. 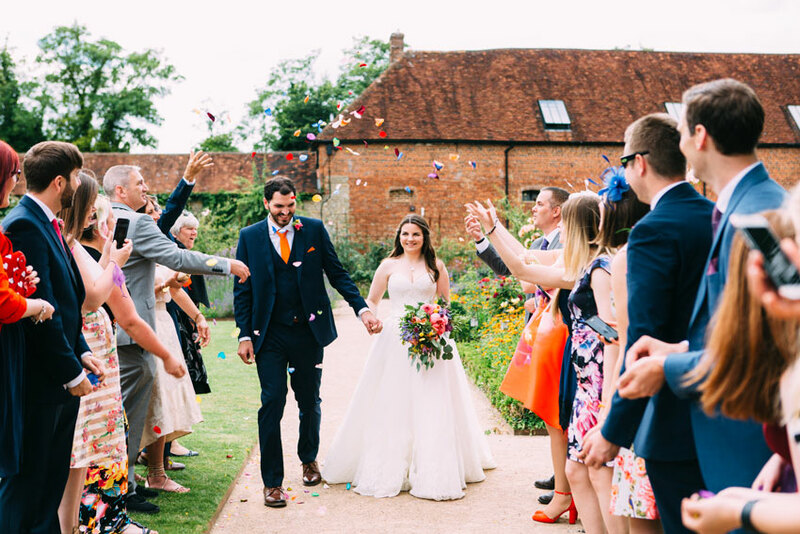 With all the guests waiting to throw confetti – everyone was very confused, but it all worked out! What made you choose Patchwork rather than a traditional gift list? 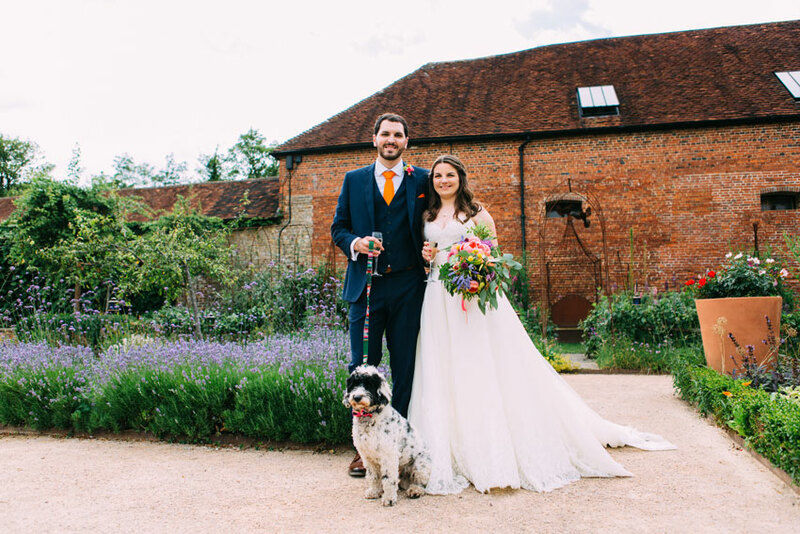 We chose Patchwork because we were already living together in a little cottage, and had everything that we need, but it seemed like a nice and personal way for people to contribute towards a shared present, that was an experience rather than anything material. It also meant that we could afford to have some extra luxuries while we were away, that we may not have been able to otherwise. The best bit about Patchwork was how easy it was to set up and use. We really liked the visual aspect as well – like piecing together your holiday. Once it was complete, it was really nice to look at. We planned a mini-moon to Andalucia in the south of Spain. We’d been to Andalucia in 2011 but had a bit of an accident with our hire car, which meant that we missed out Cordoba, one of the most important cities that we’d planned to visit. Despite this, we’d both really enjoyed our trip there and wanted to go back and finish it. This time we went to Malaga, Ronda, Cordoba and Cadíz. We drove again this time and thankfully everything went to plan! 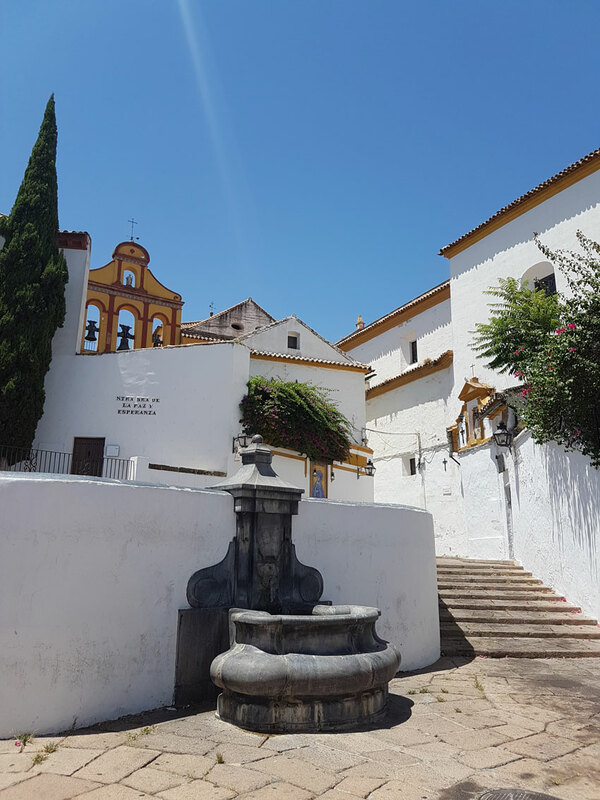 We both really enjoyed our time away in Andalucia, partly because each place that we stayed was so different, but the drive times weren’t that long – it was the perfect balance between relaxing and seeing new places. It’s also a great area to combine beach with city sightseeing. 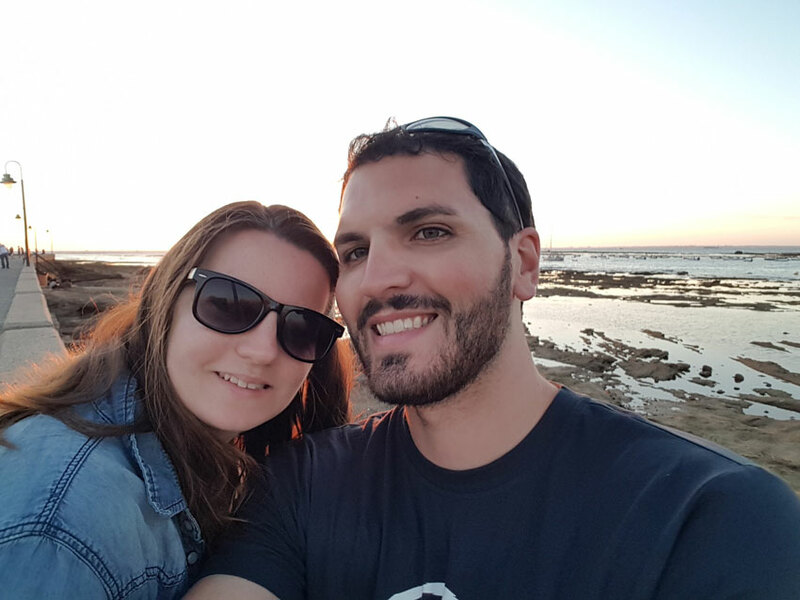 We started in Malaga – due to the flights, it made sense for us to stay there for the first night. We had our doubts about Malaga, because of its reputation, but the city is actually very charming and when we checked out, we walked up the old fort and castle that overlook the city and coastline, before heading to Cordoba in the afternoon. We stayed at the most amazing little boutique posada in Cordoba (Patio del Posadero), inspired by the Moors. There were just 4 rooms, each with a different style – ours was styled around the colour blue (Laceur). The breakfast was handmade by the owner – Jose, every day and each day was slightly different and almost like a tasting menu with a shot of kefir to start, followed by a trio of desserts and then the traditional bread with the family’s very own olive oil, fresh tomato puree and sea salt. Although it was really hot in Cordoba, it was great because we could split our day up, so we would go out in the morning and visit the sites, come back in the afternoon to our cool room, or hang out by the pool on the terrace and go back out in the evening when it had cooled down. Cordoba is a beautiful city, with so much to see and lots of great places to eat. Ronda was next on the itinerary and had some amazing scenery – we stayed at the Mirador, which had a very impressive view over the valleys below. We went to Jerez on our way to Cadiz, which is the home of sherry, if that’s your thing. 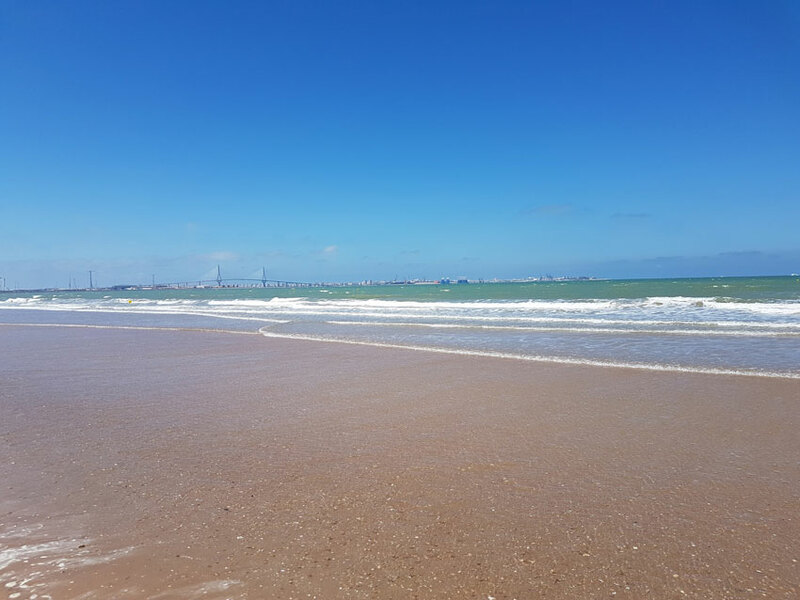 Cadiz is a lovely old city – great for sunsets, seafood and long walks on the beach. We enjoyed the junior suite at Hotel Argantonio which even had his and hers showers! It was really great to be able to think of each experience or dinner we had while we were away as a gift, and in a way, this made the joy of the gifts last longer. 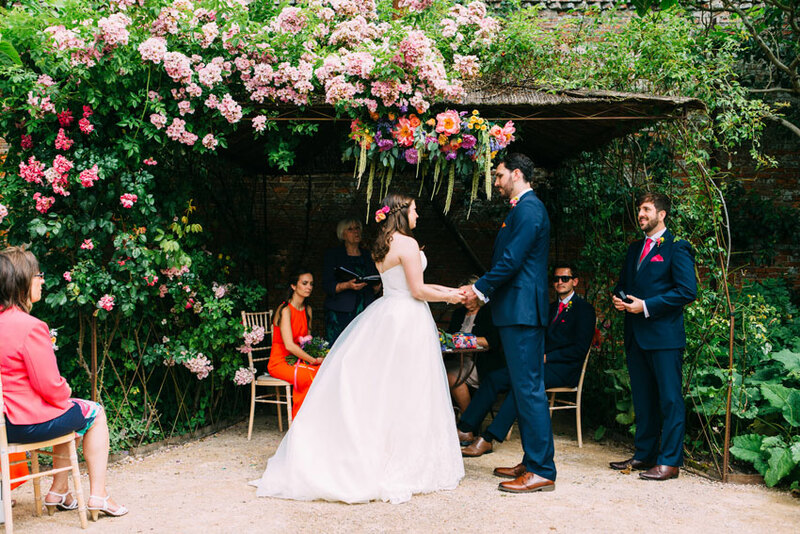 What did your wedding guests think of your honeymoon fund? They really liked that they could contribute towards something, and that it gave them an insight into what we might be visiting or doing whilst we were away. A lot of people commented on how sweet it was that they could buy our dog, Leo, a ball and bone, to keep him busy during our time away. Thank you Stace & Rosie for sharing your patchwork story with us. And a huge congratulations from Team Patchwork!